The short project Freefall was about letting an egg fall from the fourth floor whilst ensuring its safe arrival on the ground. The task was therefore to develop a construction that protects the egg from impact, either by slowing down the rate of the fall, absorbing the blow of the fall with upholstery, or any other method. Our approach was to shield the egg from the big force of the impact, so we mounted it on springs and so allowed it to move independently from the rest of the construction. We constructed a cage approximately 30 cm in height, along whose poles the egg (stored in a little box) could move up and down, like on rails. 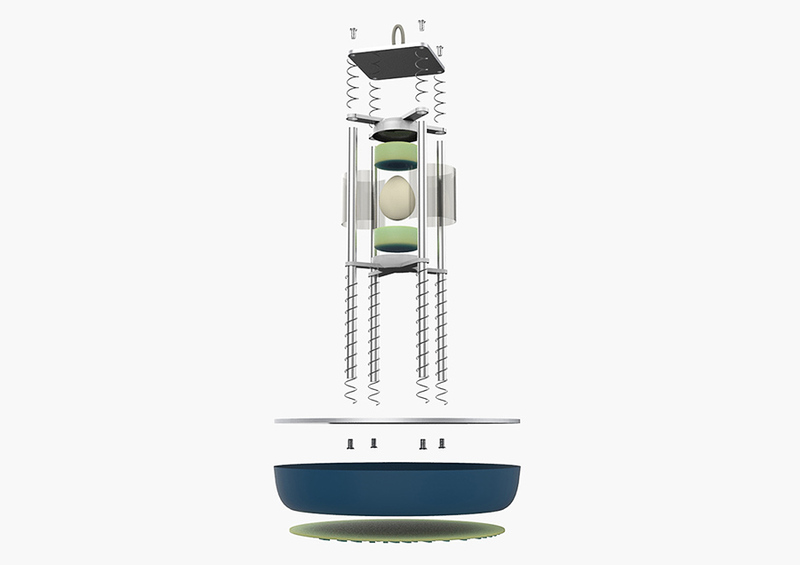 Inside its box, the egg is held in position by pieces of sponge made of polyurethane (shown in green on the diagram). As the egg is only cushioned vertically, the construction must stay upright to to ensure that the egg's fall is absolutely vertical. This is achieved by weighing down the bottom of the cage with a bag filled with granulate material (in blue).